Views give you a much more flexible approach to drill down on reporting data that means the most to you and your team. You can use Views to build reports based on specific conversation criteria. This article talks about using and managing Views to build reports. Views are a simple yet efficient way for you to filter conversation data within reports. In addition to being able to filter by mailbox, you can filter data by mailbox, tag, folder, and custom fields. You can add, edit, or remove views at any time while viewing a report, and the new data will load right away. All Help Scout Users, regardless of role, can create and edit reporting views. Select any report from the Reports dropdown menu to get started. Start by clicking on the + sign at the top of the reports page. You can add as many conditions as needed, and as you add conditions, your report will update in real time. To remove conditions, click the grey ☓ next to each line item. If all of the conditions must be true, click the AND button each time a condition is added. The AND button functions as an AND for each condition, much like the logic used in Workflows. If any of the conditions can be true, add each new item within the same field, and this will function as OR logic. The example view above is filtering data from the J&G Clothing Help mailbox, AND the damaged OR the due-today tag. Once your view is set up, make sure to click the blue Save button, name it, and click Save once again. This will save it to the Views dropdown menu that you'll be able to access at a later date, along with any other views you have set up. You can edit or delete views at any time if you'd like to change any conditions, or if the data is no longer relevant or needed. 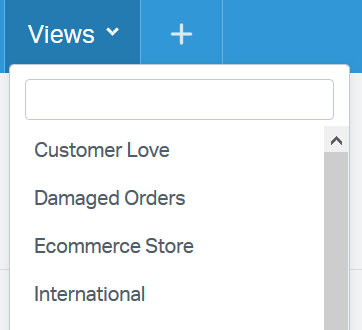 Select the view from the Views dropdown menu that you'd like to edit or delete. The report will then update to show that particular view, as well as an Edit option which will appear next to the view's name. Click Edit to start editing the view. After changing or adding the conditions to your liking, click Save Changes to save the existing view. If you'd rather do away with the view completely, select Delete to delete the view. Can I sort views in the dropdown menu? Not at the moment. Views are automatically sorted alphabetically when they're created. Can I restrict Users from creating or editing views? It's not currently possible to restrict Users from creating or editing views.